This beautiful woman’s agate gemstone pendant is elegant, yet mysterious and looks great day or night whatever the occasion. It also makes a great gift for her! 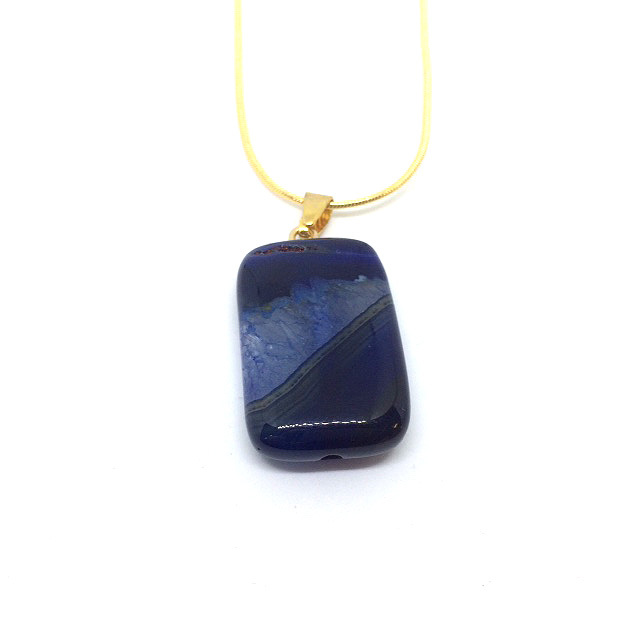 Handcrafted in our studio as part of our Back to Nature jewellery collection, this necklace features a stunning natural agate gemstone in a beautiful indigo blue colour. The gemstone pendant is finished off with a quality gold filled chain, measuring approximately 18″ (with the agate gemstone measuring approximately 1.5″). Different chain lengths are available upon request – please contact us. This necklace has a gold filled chain, gold filled chains are made with solid gold, from 50 to 150 mills of “solid” gold mixed with other alloys of metals. All of jewellery is nickel free and hypoallergenic friendly and comes in a gift box. Please note that as these are natural gemstones some colours and patterns may vary slightly. 16", 17.5", 17", 18", 19", 20", 21", 21", 22", 24", 26", 28", 29", 32"